When you come to Bryce Canyon you’re coming for the works, the amphitheater, the hoodoos, the absolutely stunning views of the red canyon. But there’s also quite the show that can go on beyond just the hikes, the views, the camping, and the canyon, and it’s the vast variety of wildlife in Bryce Canyon that you’ll have the chance to see and interact with. There are various animals that use the park to find food, water, and shelter. Many of which will go in and out of the park boundaries throughout the year. We’re not just talking the squirrels and the chipmunks that get braver and braver as the years go on. 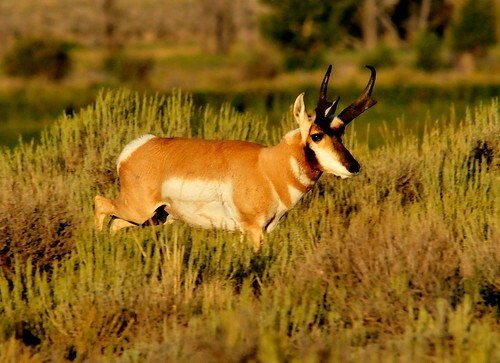 We’re talking animals like pronghorns, deer, mountain lions, and rattlesnakes. It depends on the elevation you at when visiting Bryce as to whether you’ll have a good chance at seeing some of the infamous pronghorns or not, which are often mistaken as antelope. These amazing animals roam around the park, but are marked on the NPS’s website as “uncommon”, meaning it’s harder to see them than you’d like. If you do it’s likely you’ll only see them in the Ponderosa Pine Forest, and the Black Sagebrush Meadows, both of which are around 7,500 – 8,500 feet in elevation. If its common animals that you’re after then look forward to seeing some mule deer, as they love the freedom and security that the park provides. It’s as if they know exactly where those boundaries begin and end, so they just saunter around as if you aren’t even there. Which if you were outside of the park they would be running from you as quickly as possible. Dangerous animals like bears and mountain lions occasionally make their way into the park, but it is quite rare, so you really shouldn’t be too worried about crossing paths with a mad bear or stalking mountain lion, but as always be vigilant and aware of your surroundings at all times. The one you should be aware of and constantly watching for is the rattlesnake. They’re marked as uncommon, but it is not rare to come across one of them in your Bryce Canyon travels. If you’re paying attention you should hear their rattles warning you of their presence. These snakes don’t want to be anywhere near you so as long as you keep your distance you should be fine. That’s the rundown and just the tip of the iceberg as far as the wildlife in Bryce Canyon goes. There’s just so much to see and do here that it never ceases to amaze us. And if you’re looking for not just a place to stay near Bryce Canyon, but a place to have a real adventure then follow the link to Zion Ponderosa that sits in-between Bryce and Zion Canyons.